Tweet I've told you all sorts of things about my friend Tim Halperin. [YAY! He's like totally my friend now!] Everything he does really impresses me, and his next release impresses me in a way that really hits home. Last week I received some news regarding a very close family member and Breast Cancer. 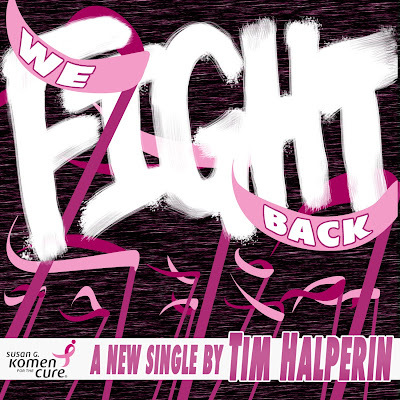 The next day began Breast Cancer Awareness Month and was also the release of Tim's latest single: We Fight Back. It's a catchy song that you'll love, but that's not the most important piece of information. 70 cents of every download is going straight to Susan G. Komen to help the fight against Breast Cancer. It's a 99 cent download. It's a no-brainer. You've gotta download it. I had him on the show to introduce the song, say a quick thing about it, and give you a preview of how great it is. I didn't want to give you the whole song like I normally would because this is a friend who deserves a shot at making the big time and it's helping a cause that now means more to me than it used to. You've heard it's good, now go ahead and head over to iTunes and download the song. You won't regret it. Also: If you happen to be a baller or someone who wants to help a little more, there's a family friend walking in the 60 mile 3 Day for a Cure walk.. She needs more donations to make it happen, so we'd all really appreciate it if you could help. Thanks on behalf of Tim, the family friend, and my family in advance!